HOME OF THE REAL DON STEELE COLLECTION! Boss Radio Legend The Real Don Steele passed away in his sleep Tuesday morning, August 5th, 1997, at his home in the Hollywood Hills, after a short bout with lung cancer. Steele had given up smoking in 1979. He was 61. Donald S. Revert was born April 1, 1936 in Hollywood. He graduated from Hollywood High School, served in the Air Force and then studied at a local radio school before working at stations around L.A. He worked in Kennewick, Yakima and Spokane, Washington; Omaha, Nebraska; Portland, Oregon, and San Francisco before returning to Los Angeles to work at the All-New KHJ in April of 1965. He is survived by his wife, Shaune. Steele did his last show on KRTH on May 16th of this year. He was one of the first to deliver the phrase "Boss Radio in Boss Angeles" on the air. "He had never been ill until this came along," Shaune Steele said. "I grew up as a fan, listening to him on the radio. We ran across each other at KRLA, where he was working. We knew each other about five years before we got married five years ago," she said. 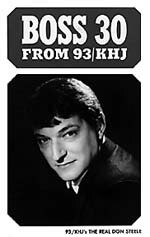 In the book Los Angeles Radio People, Mr. Steele recalled the beginnings of Boss Radio in May, 1965: "We were standing literally at ground zero, then (his radio format) became a huge giant. It was like a mushroom cloud that went up � heavy on the mushroom." Mr. Steele was never one to analyze the evolution of rock radio. 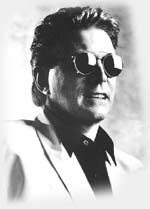 In a 1995 interview, he insisted, "Look, you take the Motown sound and the British Invasion and you throw in Elvis and Roy Orbison, and you have a music mix that's hard to beat at any time or any place." In 1990, several major record companies honored Mr. Steele, Robert W. Morgan and format creator Bill Drake at a Boss Radio Reunion Dinner. It was an immediate sellout. "Morgan was the first one hired for Boss Radio," Drake said. ''He recommended Steele. He flew down from San Francisco. I was a little leery because I had heard he was kind of a crazy man, but it turned out he was very dedicated to his work." 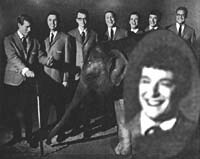 The Real Don Steele (inset) with the original KHJ Boss Jocks and their Boss elephant. Mr. Steele stayed at KHJ until 1973, then moved on to KIQQ, KTNQ, KRLA, KODJ, KCBS and arrived at KRTH in July 1992. He made his acting debut in ABC-TV's Bewitched, had his own weekly TV dance-party show and appeared in such movies as Death Race 2000, Grand Theft Auto and Eating Raoul. He starred as "Screamin' Steve Stevens" in Rock 'n' Roll High School, "Rockin' Ricky Rialto" in Gremlins, and in 1996, he played a driver in Tales from the Crypt Presents: Bordello of Blood. He recorded commercials, and at one time had a successful, nationally syndicated radio show. He received a star on the Hollywood Walk of Fame in 1995  it's at Hollywood Boulevard and La Brea Avenue. "It must be a sad day for Tina Delgado,'' author-historian Don Barrett said of Mr. Steele's death. Delgado became part of Mr. Steele's afternoon mantra, "Tina Delgado is alive, alive!" Who she was is a mystery he took with him. Not even his wife knew. "He never told me and I never asked," Shaune Steele said. "I felt if I had asked him that when we were dating, we never would have gotten married. He didn't like people to get too close. We had only a very small circle of intimate friends." 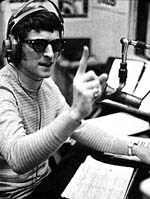 A poll seeking the top 10 disc jockeys in Los Angeles from 1957 to 1997 rated Steele second among the 232 personalities nominated. The ballot was printed by Barrett in his 1994 book, and results are published in the second volume of his book. Rick Dees said of Steele in Barrett's book, "Pure, raw energy and focus. And he still has it every day. That's amazing!. Boyd R. Britton, who worked with Steele in the late 1970's at KTNQ said, "He educated me in star quality, in energy and focus. He epitomized energy on the air." Reflecting on Steele's habit of using very high headphone levels, Britton said, "Very early on he was extremely hearing damaged. It was very difficult for him to hear in a group. That made his natural speaking voice almost as loud as his on-air voice." I don't think I'm any different now. I've never stopped. I've never changed. I never did anything else. This is the music of my life." THE REAL DON STEELE MEMORIAL TRUST FUND has been established at Don's alma mater, Hollywood High School. A gift will be awarded annually to a deserving senior for college expenses. The student will be a member of the Hollywood High School Band. Thank you for your help in honoring Don's memory. PLEASE VISIT THE REAL DON STEELE COLLECTION! Read more about The Real Don Steele: at the Boss Radio Forever site and Johnny Williams' 440 Satisfaction site. Real Don Steele Photos courtesy of Ray Randolph, Ron Jacobs, Steve Michaels, Shotgun Tom Kelly and KRTH-101. Tina Delgado Audio courtesy of Woody Goulart. and an article by Myrna Oliver, Los Angeles Times. ©1997, 2000 The Reel Top 40 Radio Repository & REELRADIO, INC.